If you do not understand CIE 1931 diagrams and how they relate to color gamuts you should first read the article Color Space Basics. The solid triangle is the gamut of the Nikon D70. This is probably representative of most digital cameras. The sRGB gamut lies entirely inside the Nikon D70 gamut. 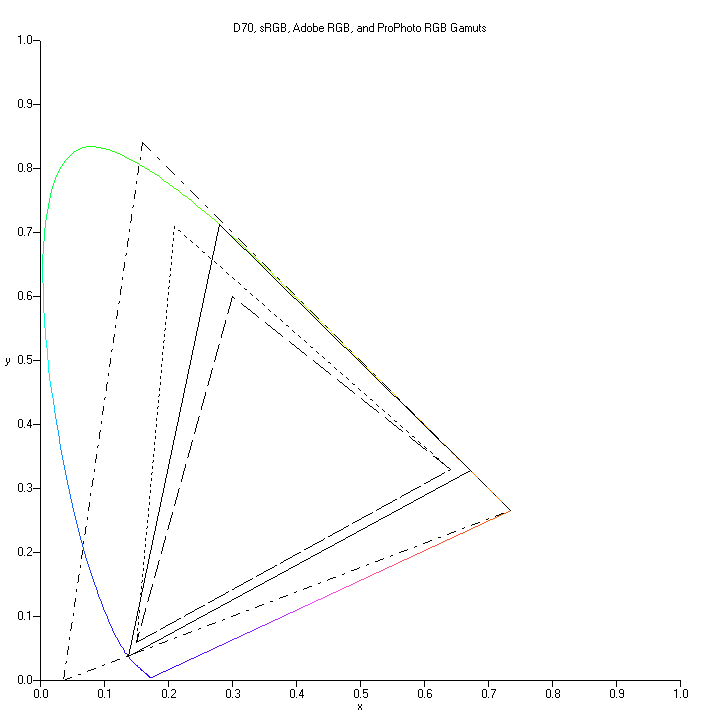 The Adobe RGB gamut is slightly larger than the sRGB gamut; it covers more of the Nikon D70 gamut. Of the gamuts shown, only the ProPhoto RGB gamut entirely encloses the Nikon D70 gamut. Remember, the working color space is only used for your intermediate results. To preserve the widest range of colors I recommend using ProPhoto RGB as the working color space. At (or near) the end of your workflow you should convert from the working color space to the color space for the destination device. For computer display and many printers this is the sRGB color space. But if you are preparing for a specific printer and you have the profile for that printer then you should convert to that.